Jack Lewis, the Bible Study Dog (BSD), seems to be experimenting with a new (for him) form of prayer. Jack has become a master of the prayer of persistent asking, after the model of the widow seeking justice from the corrupt judge (Luke 18:1-6). Like the widow wearing down the resistance of the judge, who feared neither God nor man, caring not a rip for anyone but himself, but who finally gave justice as he foresaw that the woman would keep coming until she wore him down, the Bible Study Dog is a past master of the prayer of harassment. I take the prayer of waiting to be not only a patient, trusting waiting for God’s answer; but also, like a good waiter or waitress in a restaurant, an attentive, watchful attempt to anticipate and fulfill each of God’s directives to us. So, satisfied with the results of his experiment, Jack Lewis quietly slipped out into the dark. This same week, I was scheduled to have a minor out-patient surgery in a nearby hospital. It seems that a screw in my foot from a previous surgery, was being ejected by my body. The surgeon proposed just taking, the now unnecessary screw, out. I could be heard joking, for a few days, that I had a screw loose. The puzzled looks on people’s faces showed that they were unsure whether I meant a figurative screw in my head. Unfortunately, that screw will be loose until Yeshua comes and makes all things new! I wondered what I should take to read in the hospital while I waited through the surgical preparation. I decided that I would take a few of my scripture memory cards; I would still be able to occupy my mind when I couldn’t hold my Kindle in my hands. Memory is necessary to any defined way of life, if only to continue on the path one has chosen, and not wander repeatedly off the path or into dead ends or cul de sacs or dangerous obstacles. When I was young, I would hike in a National Forest on a path for a half-hour sometimes, until the path would dead end at a cliff or a steep rock face; I had somehow been diverted into a deer path! In primarily oral cultures, the people of God in the Ancient world, both Jews and Christians, were dependent on memory to stay on the path that God laid out for them. 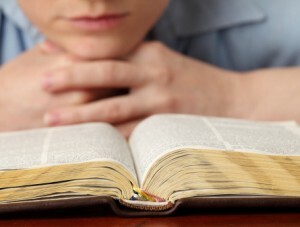 The people of God are repeatedly called to exercise memory, which in turn requires the practice of memorization, especially of Bible texts (but also ideas, events, connections, songs, etc.). In the verses at the beginning, we see that God called families to talk about the Torah in everyday life, in the midst of all activities, and not only when a priest read and interpreted it. We also see that the godly meditate, chew on, look on the various aspects of the Word of God “day and night.” They are called to “not forget” the teaching and the commandments. They have “stored up your word” in their hearts that they might not sin. Christians are called to “singing and making melody to the Lord with your heart”, which surely involves memory. When Christians receive the Body and Blood of our Lord Jesus Christ we are called to remember his sacrificial death for us. Many calls to remember who we are now in Christ can be found in the New Testament Letters. Among the results of memorizing and meditating on Scripture, the texts above refer to a vigorous life, a long life, fortification against sin, prosperity, and peace. To summarize: no way of life without memory, so therefore no Christian way of life without memory; not much memory without memorization, therefore to really flourish as a Christian one must do some memorization. Let me add that the Holy Spirit usually works in our lives through the Word, “the Sword of the Spirit.” The more Word of God we have in our hearts and minds, the more the Spirit has to work with in us. Ultimately, we are seeking to re-describe our world in terms of the stories, words, and categories of the Bible, that is, a biblical worldview. Today, many Christians move through life expecting that whatever of Christian understanding sticks to them from worship, devotions, corporate Bible study and fellowship with Christians, is all they need. What doesn’t stick, what is forgotten? Oh well… Many years ago, I counseled a severely depressed young woman, after she had already been through two psychologists in our congregation, and who knows how many state counselors. After months, I was at my wits’ end, sometimes looking longingly at the door or doodling nooses on my notepad. Then I gave her worksheets about what God thought of her (love, forgiveness, acceptance, beautiful, etc.). She had to look up Bible verses and fill in the blanks. The next week she came back and she was better! Then a few weeks later, she came back completely overwhelmed by life. I explored with her what had happened to her during the week: she had been prayed for after a worship service. I gave her more worksheets and she came back better again. Eventually, I discerned that when someone prayed with the woman, she expected that God would instantly heal her, without the necessity of remembering Bible verses. So forgetting what she had known from the Bible, she would become vulnerable to depression again. I know that this is not the experience of everyone, and I have nothing against praying with each other, but don’t many of us expect to grow in Christian knowledge, wisdom, and maturity without effort? When I lived under my father’s roof, my dad would ask the family to memorize chosen Bible texts, often quite long texts. Off and on through the years, we would recite our assigned verses to Dad at the breakfast table or during evening devotions. Sometimes I would memorize by just looking at the text and repeating it aloud, adding a phrase when the earlier phrases were memorized. Sometimes I would make note cards, that I could refer to frequently during the day. This memory activity, was not something we could be disciplined about if we slacked off; it was a friendly competition. Under my dad’s direction, I memorized Romans 4-8; John 1, 14-17; Matthew 28:18-20; Ephesians; Psalm 1; Psalm 23; Galatians 5:16-25; 1 Corinthians 13, and parts of chapters 1 and 2: parts of 1 John; Hebrews 12; parts of Colossians; Philippians 2:1-11; parts of Revelation 1-3; and probably some other texts that I have forgotten. I studied German in Jr. High and High School, but it was not taught with a good method; today I am not fluent in German. I studied French at two colleges, and eventually became fairly fluent in French. I made memory flash cards and I wrote out paradigms frequently. Before an exam, I would meet with a study group, and write out vocabulary and grammar on one page as we talked; during the exam, when necessary, I could remember where something was on the study page. In seminary, New Testament Greek was learned in the same way. Biblical Hebrew was not so easy, but I still recognize a lot of it. As a pastor for twenty-some years, I memorized certain passages of the Bible like Colossians 3:1-17, in The Message translation, and Romans 12:1-2, that could be used as charges to the congregation. I also memorized Bible passages each week for the sermon. I wanted to have a flow and a precision when I spoke. Am I writing about this in order to boast? No, well maybe I am; but mainly I’m writing about my experience for two reasons: 1) to show that this is how memorization is done, and 2), to show that the more you do it, the more you can do it. This post was powered by the album, “RUN WILD. LIVE FREE. LOVE STRONG.” (2014) by for KING & COUNTRY; the Album, “When Numbers Get Serious” (1999) by The 77’s; and the album, “Live From the Woods” (2015) by NEEDTOBREATHE. Tags: Jack Lewis the Bible Study Dog, languages, memorization, waiting on God | Permalink.